The Myshak Group of Companies handles a large variety of innovative solutions, top-tier services, and quality projects. 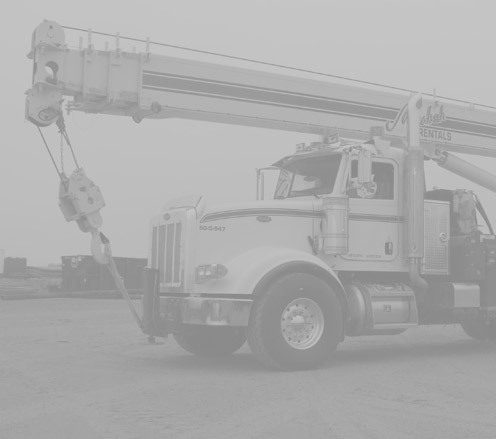 With hundreds of years of combined experience in multiple industries, we set the industry standard for high-quality and knowledgeable solutions when it comes to mobile cranes, transportation service, and both bare and operated equipment rentals. We have a wide variety of specialized construction equipment available for rent including mobile cranes, rough terrain cranes, picker trucks, fuel & lube trucks, water trucks, site tractors, trailers, wheel loaders, etc. We also manufacture and supply, for both rental and sale, engineered, designed and certified specialized rigging, man & material baskets, spreader bars from 5 - 300 ton, and a variety of other specialized crane & rigging needs. Myshak mats are available in several different sizes and styles. From hand/outrigger pads ,steel framed rig mats to, swamp matting, to 12” x 12” hard wood heavy lift crane mats, Myshak is the leader in matting your ground solutions. We manufacture the majority of our crane mats in house here in Acheson, AB. From our standard 4’x20’ hardwood crane mat to our ability to accept custom orders for any size needed, Myshak is able to supply the right mat for the job. Maintaining a large quantity of each style mat on hand at all times has always been a staple of The Myshak Group. This allows us to supply our customers with any quantity of mat large or small immediately without delays. High-quality reliable equipment does you no good if it’s just sitting in storage. 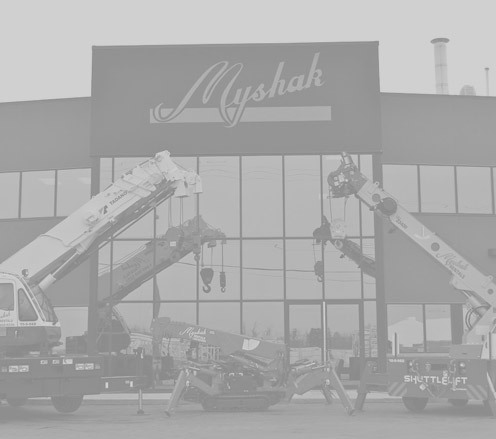 Myshak brings your mobile cranes and other equipment and maintenance out to the field where you need it to get the job done. It’s all part of providing the best customer service in industrial equipment rentals and sales. Contact us to find out more. Myshak Crane & Rigging Ltd. now has the most cost effective, safe and reliable solution for moving loads of any size. Jack and slide is an alternative way to successfully move masses where crane access is limited, and can also be used to assist cranes in moving loads. With an overall combined industry experience of more than 75 years, Myshak Crane & Rigging can provide solutions to suit needs in all types of industries. Myshak Crane & Rigging’s new, unified jack and slide system can be used for moving, setting, weighing, loading and unloading masses. Jack and slide can be used in the oil and gas industry for compressors, modules, e-houses & buildings, and vessels. It can also be used in the power and generation industry for generators, turbines, transformers and coal mills. 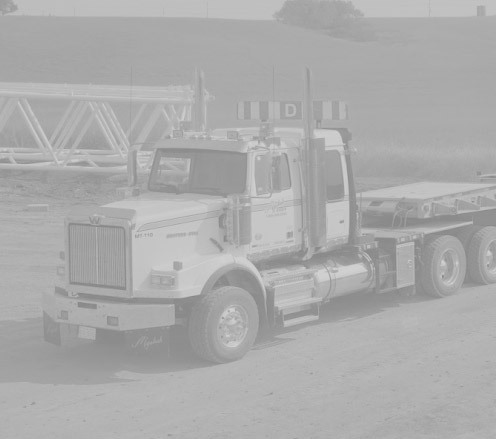 In addition to jack and slide, load equalization dollies can be used to ensure concrete surface protection when moving oversized loads into place with cost and time on your side. Load equalization dollies are most effective in moving switch gear, industrial machinery, electrical panels, CNC machines, lathes and breaks & presses in warehouse and manufacturing settings. Please contact us for a quote to see how we can make your job a success. Myshak provides engineering services on demand for complex projects. Currently, we have warehousing and storage facilities available with rail access. We provide indoor and outdoor storage complete with material handling and categorization for all your requirements. The Myshak Rigging division supply’s various types of crane and hoisting attachments to both our construction clients and our own operated crane groups Myshak Crane & Rigging and Energy Crane Service. Our Rigging division has been used by our group of companies and supplying our rental customers with rigging attachments for almost 15 years. It wasn’t until early 2015 that we realized it was time to create a separate group that was dedicated to servicing our rigging attachment customers on a full time basis. Myshak Group is always looking for innovative and motivated people. Check out our careers section regularly to see if we have any open positions that you may qualify for.